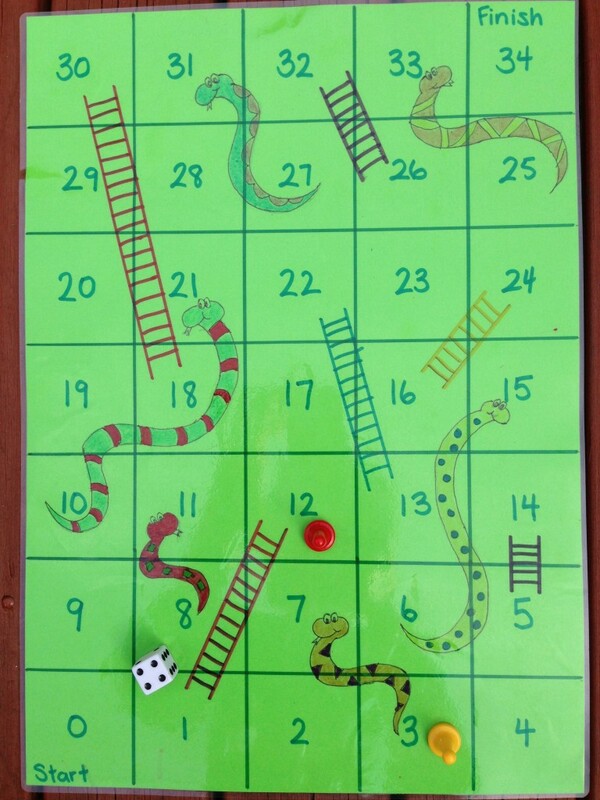 You probably remember Snakes ‘n’ Ladders as a classic game from childhood, but did you know the educational benefits it offers? I diverge, slightly, from my normal literacy posts to share these insights with you! Playing this simple game will help get your child ready for school. To begin with, don’t go out and buy the real game because it’s too much for little kids; it goes all the way to 100 and they’ll lose interest before it’s over. Instead, you can make your own! Giving children input into something like this gives them a sense of ownership, which is motivating for them. My son and I made one together – he chose the colour of A3 paper, he told me what colours to use and where to put the snakes and ladders, etc. Our board goes from 0 to 34. After it was finished, we laminated it. 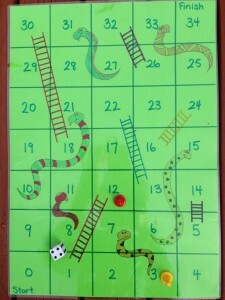 Here are the reasons why you should play Snakes ‘n’ Ladders with your child! Counting – An obvious one, but very important nonetheless! Children need to learn to count for real purposes. Playing games is a fun and motivating way to practice counting. One-to-one correspondence – For children, this basically means accurately counting objects, matching their finger as they say the number aloud. In this game, being able to count and simultaneously move a playing piece from square to square demonstrates one-to-one correspondence. This skill develops in the pre-school years and is essential, not just for mathematics, but also for reading. When children point to the words in their beginner-reader books, they are demonstrating one-to-one correspondence. If children have not yet developed this skill, they are not ready to read. Numeral Recognition – This game has a number written on every space, from 0 to 34, which makes it ideal for learning to recognise numbers. And yes, make sure you start with zero. Children need to understand that zero is a number. In the early years of school, they will be using number lines (which start at zero) for addition and subtraction. Sequential Numbers—Knowing the order of written numbers, such as 15-16-17 is a must in this game. The squares go from left to right in the bottom row, but right to left in the second row, and so on. This means children need to pay attention to the numerals on each square, so they know which way to move their playing piece, or they might move backwards! Subitizing – Subitizing is the ability to see a small amount of objects and know how many there are without counting. This is another important skill and it will develop by using a die (dice). At the start, children may need to count the dots on the die every time they take a turn. But after some practice, they will come to recognise the number without counting at all. Maths Language – Here is another literacy link. There are many maths words/ concepts that children need to understand. This game enables children to use and understand these terms: forward, backward, before, after, next, which way. Fast & Fun! When you make your own shortened version of this game, it takes no time to play. Sometimes a game takes less than 5 minutes for my son and I to play! This means my son doesn’t mind losing as much, because we can play another game right away. He has a blast playing Snakes ‘n’ Ladders and has no idea what great maths concepts he’s learning in the process! What number did you roll? I landed on number ___. What number did you land on? You’re on number ___. What number comes next? Which way do you go next? What number do you need (to roll) to get to the next ladder? What number don’t you want (to roll) because you’ll land on a snake! How many more do you need to win? Which way is forward? Backward? I hope you’ll give this activity a try at your house. If you do, I’d love to hear about it and see photos of your Snakes ‘n’ Ladders board!